Five years ago, I did one of the most frightening, brilliant things I had done in my 16-year existence : hit the “publish” button on Amazon’s Kindle Publishing page, and in that moment, released my first book to the world. The journey had started long, long before then, when I was 13 years old. I had been coming up with stories & working on a variety of books, mostly about children/teens & their pets, since I was about ten years old. I had completed several books prior to writing Strange Occurrences, each one somewhere around 50 – 70 typed pages. Strange Occurrences originally started as a screenplay I was going to write, but when I realized that to turn it into a film would be an challenging, expensive endeavor, I decided to write a book about the idea instead. My book was going to be about a young teenage girl who got sucked into another dimension, one which would allow her to see other people’s points of view, & understand how her actions fit into the grander scheme of things. This was inspired by watching the movie It’s a Wonderful Life for the first time, & being awed by the end portion of the film, where George Bailey sees what things would have been like if he’d never been born. I remember a distinct moment from when I was 13, and walking on the treadmill stationed in my parents’ bedroom. My grandmother had died recently. I decided to incorporate this element into my story, & have the main character’s dying grandmother warn her about the “Strange Occurrences”, something the grandmother had experienced when she was the main character’s age. Originally, the main character’s name was going to be Carol, inspired by the name of Jack Ryan’s wife in the film Hunt for Red October, which I must note, I was OBSESSED with at the time, but eventually decided on Cathy. As I walked on the treadmill, I decided that Cathy would “use walking as a means of escaping from her problems” and traverse her neighborhood with her dog. Strange Occurrences really began months later, as I sat on the bed in a cheap hotel room, holding the old Dell laptop on my lap, & leaning back on the made bed against a wall of stiff hotel pillows. We were moving to a different house & staying in the hotel while we looked for houses. I described the hotel as being “oppressive, like a dungeon”, & wanted to do something to take my mind off this fact. I remember sitting on the bed, typing the opening lines, looking over at my sister & explaining what I was writing, & my parents coming back inside from retrieving something from the car. This was where I typed those first few pages. Over the next few months, even as I attended college as a dual-enrollment student, I worked on Strange Occurrences in my spare time. The story took shape, and changed multiple times. After a long, arduous editing process which spanned several months and included both me & my family (including my relatives) reading through my book several times, I finally worked up the courage to start sending off samples to a variety of big-name publishers. Eagerly, I awaited a response, & imagined the perfect-movie-moment in which I would open their letter with trembling hands, & read, “we are interested in publishing your book, and would like you to send us the rest of it”. One day, a letter arrived in the mail, & I opened it. I was both terrified & elated that after weeks of waiting, I’d finally received a response. When I opened it though, I saw the dreaded words, & my spirit temporarily fell : “unfortunately, we are not interested in your manuscript at this time.” I was temporarily surprised and disappointed by this, but being a confident optimist, I kept thinking, “Maybe the next letter will be a ‘yes’.”. After receiving several rejection letters, I realized that the best course of action would be to take matters into my own hands. For a long time, I hadn’t been open to the idea of self-publishing a book. This was mostly because I was in love with the fantasy of having an actual publishing house send me a letter telling me they liked what they’d written. Looking back, I was firmly set on having this because I felt like getting a deal with a big publishing house was a very prestigious thing. Furthermore, achieving this would not only prove to myself that I was indeed good at writing, but it would prove to those around me that writing was a legitimate career, & would be the thing which would make me a “real” writer. Thankfully, two things happened around this time. (1) My father repeatedly told me about how he thought self-publishing, especially ebooks, was a good idea, & sent me multiple articles about successful authors on Kindle. (2) I was starting to get fed up with waiting for people to give me approval about my books, & I started wondering why I was letting someone else hold me back from doing what I wanted to do. I came to the conclusion that I might as well try self-publishing, & began researching how to make this happen. To be honest, I procrastinated publishing Strange Occurrences by endlessly editing it. “I just want it to be perfect.” I thought. I kept finding things about it that I could change or improve. “Just one more edit, then it will be done.” I kept saying that, for a few months. Eventually, I realized that I could edit it a thousand times & always find things about it that could be made better, but if I did that, my book would never get published. “You’re afraid of success.” My dad told me. So I got to work on painting the cover, & wrote the book description. 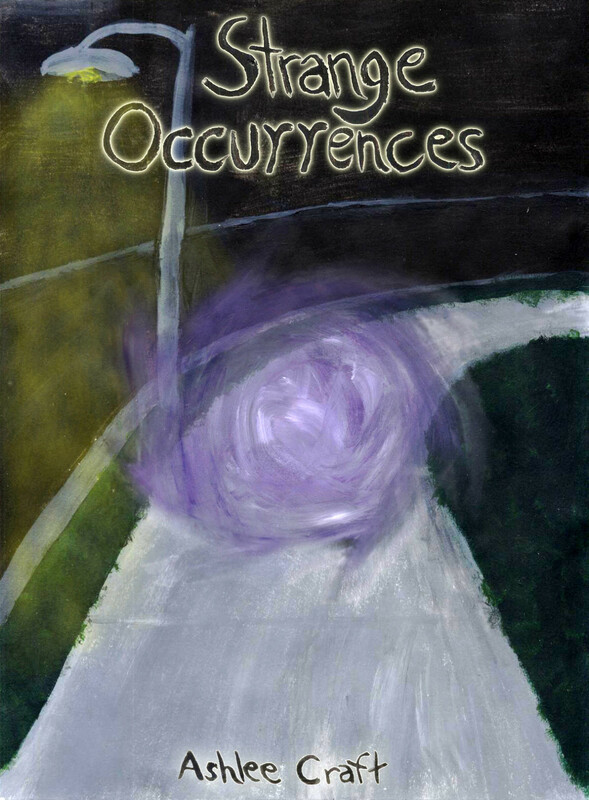 I remember sitting in a kitchen chair one afternoon, sunlight streaming in, & I sketched out the cover for Strange Occurrences on a piece of paper taken from a sketchpad of mine. Once the sketch was perfected, I filled it in with paint. I wanted my sister to photograph me painting it, “to document this moment.”, I told her. A while later, the cover was done. I painted the title words on another piece of paper & added them to the cover image in Photoshop. After learning about how to format a book, making multiple formatting errors, & finally getting it right, then came the moment when I was on the Kindle publishing page, filling out the information about my book, & uploading my files. April 4, 2011. It was finally time. I put my cursor over the “Publish” button, took a few deep breaths, & looked around at my family gathered there on the couch. “I’m going to publish it now.” I told them. All my hard work & all the effort I had put into this book was finally coming to life. I didn’t know where I was going by doing this, or what would happen, and even though I didn’t feel entirely ready, I knew inside that I really was. I hit the publish button. A feeling of relief, & of nervousness, filled me, but mostly, it was a feeling of accomplishment. I’d done something awesome, especially for a 16-year-old. I was really doing this. By doing this, I was saying to the world that I believed in myself & in the things I created, & in my opinion, there are few statements as powerful as that. In the five years since then, I have written more than 45 books & started a monthly zine which currently includes 10 issues, as well as a variety of albums, blogs, & videos. I’ve written a novel in three days, participated in multiple NaNoWriMo challenges, & been featured on a TV interview with Fox News. These are things that I never would have thought were possible five years ago, but by the mere fact of them happening, it proved to me that I was dedicated and confident enough to make this happen for me. To be a writer. To make my goals happen, without waiting for anyone else to tell me that I was good enough. Here’s to the five years since then, & the next five years. Here’s to all the people who are just starting out as writers & trying to get people to read their books. Here’s to those who came before me & set the stage, & the ones that encouraged me to go farther. Here’s to the people questioning if their books, their writing, their music, their art, their dreams, are good enough. Here’s to the people tired of waiting for others to tell them it’s okay to take the next step, those who take their goals into their own hands & nurture them & turn them into absolute brilliance, even if it feels messy or amateur. Here’s to scared, ambitious teen hitting the “Publish” button on her first book & seeing that her dream of being this was possible. Here’s to courage, in whatever form for you it may take.